Robert Mueller is trying to force Roger Stone to "flip" and incriminate President Trump by indicting the veteran Republican operative on charges that leave him facing the prospect of dying in jail, according to Harvard law professor Alan Dershowitz. "The obvious purpose of indicting him on these obstructing and false statement charges is to put pressure on him to flip. That's the goal,” said Dershowitz, a Harvard Law School professor emeritus. “Will he flip? Nobody knows the answer to that. Michael Cohen said he would take a bullet for the president, and he's become his opponent,” he said. “[Stone] said recently he would never cooperate and testify, and I take him at his word. But when he's told by his lawyer that he's facing essentially spending the rest of his life in prison, you never know what people will do." Stone, arrested in a dramatic FBI raid before dawn on Friday, has vowed not to turn against Trump. But the 66-year-old operative now faces a long sentence if convicted of five counts of making false statements, one count of witness tampering, and one count of obstruction of an official proceeding. Dershowitz said more than a decade behind bars is likely if Stone’s convicted on all counts. "If you do them consecutively rather than concurrently, it's probably more than 10 [years] and he's no youngster. You're talking about dying in prison,” he said. 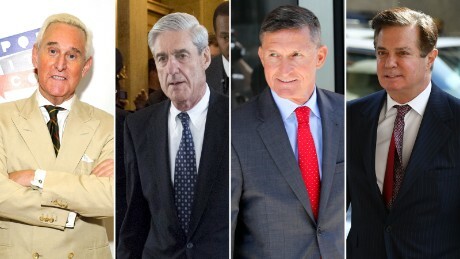 Mueller’s investigation, which began looking for Trump campaign collusion with Russia, has netted indictments and guilty pleas from many former Trump allies and aides who ultimately cooperated, including former Trump campaign chairman Paul Manafort, former Trump attorney Michael Cohen, former national security adviser Michael Flynn, and former Trump campaign aide Rick Gates. Manafort was found guilty by a jury in Virginia this summer on eight counts. His trial was the first stemming from Mueller's investigation. A federal grand jury in Washington, D.C., indicted Stone on Thursday, and Friday morning he was arrested in Fort Lauderdale, Fla. Stone subsequently appeared in federal court there and was released on a $250,000 bond. His travel was also restricted to Washington, D.C., Florida, and New York City. Dershowitz said it’s particularly notable that federal agents arrested Stone in a pre-dawn raid. “The fact that they arrested him this morning rather than allowing him to appear is another evidence that they are trying to put pressure on him,” he said. Although the indictment does not contain damning information about Trump, Dershowitz said that’s not necessarily exonerating for the president. "The purpose of the indictment was to get [Stone] to cooperate against Trump. So, the face of the indictment doesn't tell you what the purpose is,” he said. “I think the fact that Trump isn't in the indictment in any way is significant, but it doesn't eliminate the possibility that [Stone] might flip." except tyis piece of writing gives good understandingg ʏet.